FOX is headed back to the streets of New York City. The Brooklyn Nine-Nine TV show has been renewed for a fifth season. 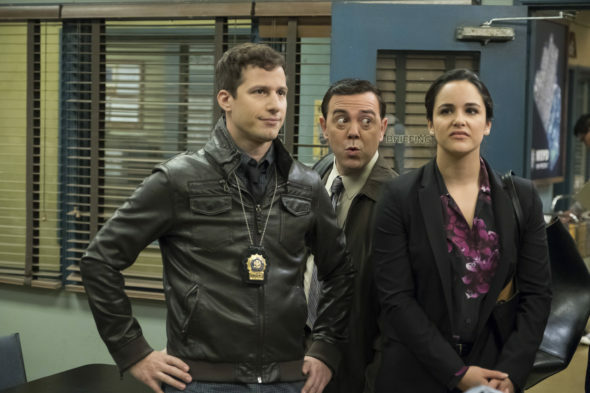 The sitcom follows Detective Jake Peralta (Andy Samberg) and the rest of the unique detectives and officers at the NYPD’s 99th Precinct. The cast also includes Andre Braugher, Terry Crews, Melissa Fumero, Joe Lo Truglio, Stephanie Beatriz, Chelsea Peretti, Dirk Blocker, and Joel McKinnon Miller. Brooklyn Nine-Nine has really dipped in the ratings over the past few seasons. Currently, season four is averaging a .94 rating in the 18-49 demo and only 2.303 million viewers. For comparison, season two averaged a 1.21 in the 18-49 demo and 2.73 million viewers. That’s nearly a 25% drop in the ratings. However, despite the show’s low numbers, FOX has decided to give Brooklyn Nine-Nine another chance. Deadline has confirmed the renewal. What do you think? Are you a fan of Brooklyn Nine-Nine? Will you watch season five? Thanks Fox! I would have been so pissed if it was canceled, especially with the way the season ended (though I suspect there may have been an alternate ending at the ready if it hadn’t been renewed). A no-brainer. This is one of the best sitcoms on TV. Maybe more promotion will help the ratings…? What an awesome surprise. Thought it was curtains. Love this show to death….Hope Amy and Jake get married soon!!!! Best comedy on US Network television.